I have been away from my garden for 7 days. That probably sounds like I’ve been away for a week, but the evidence inside the garden fence says otherwise. The plants, and the path-that-disappeared say that I have been gone for the entire season. The hot weather and moderate rain have encouraged wild healthy growth. The tomatoes, in particular, are now officially out-of-control. Their vines are heavy with fruit. I am looking at days and days of canning, once the green turns to red. My daughters, the other tomato-eaters in my home (tomato eating is gender-specific here), cannot return from their summer adventures soon enough. I am facing a tomato tsunami. I am going to pickle cucumbers this weekend. I must. The cucumber vines are groaning as well, and their fruit is ripe. But I will be looking over my shoulder all the while, because the tomatoes are gaining. 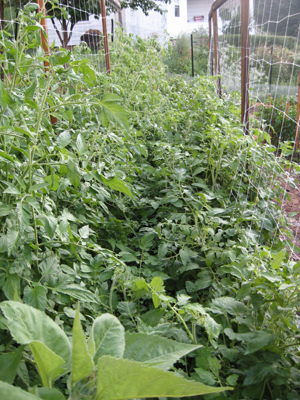 Once upon a time, there was a path between the heirloom varieties (on the left) and my paste tomatoes (on the right). I may have to add a machete to my arsenal of garden tools.